Safety and comfort is the reason our handle was invented, providing you with the easiest and most comfortable carrying experience possible (without someone else doing the carrying for you!) 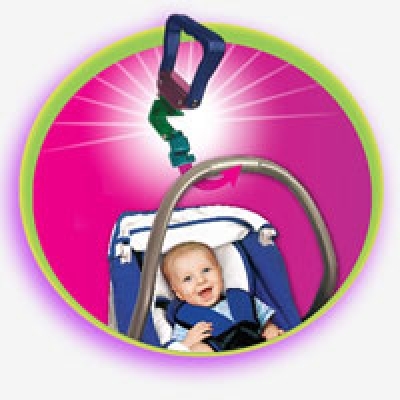 The durable, easy safety latch adjusts with a simple turn of the thumbscrew, giving the tightest and most secure fit possible.Infant carrier handles are not manufactured for your comfort and safety; you being the one who actually does the carrying. Why is this handle so effective? It places your hand in the proper position. A neutral position is the strongest and least vulnerable position to use.Our patented technology solves the problem of carrying your baby from place to place. The Grip ‘N Go Handle places your hand in a neutral position eliminating the muscle discomfort associated with carrying your child in their infant car seat. The Grip ‘N Go Handle is the only Patented Ergonomic Handle designed for the human hand on the market.